Protestors raise their arms as they march. 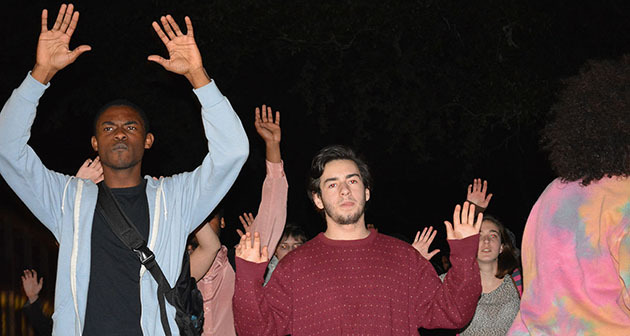 The crowd, which started as 20 students, grew to over 100 as it passed through Tulane’s campus. The protestors then marched back to the Marquette Lawn at the front of Loyola where, around 12:30 a.m., they knelt and took 4.5 minutes of silence just as Michael Brown’s family had requested from Ferguson protestors. This represented the four and a half hours that Brown’s body laid in the street after he was fatally shot. On the Marquette lawn, Umana spoke to the crowd, thanking them for their support and urging them to work for social justice in economically disadvantaged neighborhoods nearby, like the Freret neighborhood near the two universities. After this, the protestors marched to Tulane’s Howard-Tilton Memorial Library. “I’m down to march all night,” Umana said. The standoff lasted ten minutes until Umana was allowed into the library, where he negotiated for another ten minutes with TUPD. Finally, students were allowed to process silently through the library’s entrance and around the third floor with their hands up. After the protestors left the library, they applauded and continued to McAllister Drive, where they held a “die in,” tracing their bodies in chalk on the pavement and writing messages about the decision. Protestors proceeded to the new Tulane freshman dorm, around The Boot Bar and Grill and back to the university area, where the protest ended after 2:00 a.m.
Maroon Minute 11-25-14 from Loyola Maroon on Vimeo.